The producers traveled to Abilene to photograph the Interstate Paramount. The Paramount opened in 1930 and is an atmospheric theatre with domed ceiling and twinkling stars. After being threatened with demolition in the early 1980s, the people of the city united to fund its full restoration as a performing arts center. 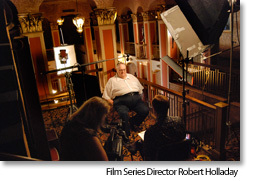 The theatre also became the home for a long-standing classic film series. On this weekend, we documented the enthusiastic audiences that came to watch Butch Cassidy and the Sundance Kid. 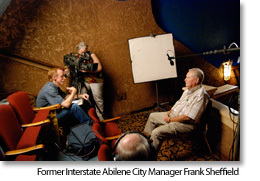 In addition, we shot interviews of Frank Sheffied, former Interstate city manager for Abilene, Robert Holladay classic cinema series director, and Lynn Barnett, Director of the Abilene Cultural Arts Council. This filming, made possible by a generous donation from El Pasoan Betty MacGuire, will be followed by coverage in October of the Eastland Interstate Majestic-- a rare Interstate theatre still playing first run movies, and the last picture show in the county of Eastland. Click here to see a gallery of pictures from the shoot.